There are those who feel so hopeless and helpless that they don't believe that anything can help them - not Bach Flower Essences nor any other treatment. In Dr. Edward Bach's words, they suffer from "Very great hopelessness, they have given up belief that more can be done for them. Under persuasion or to please others they may try different treatments, at the same time assuring those around that there is so little hope of relief." Fortunately, Bach Flower Remedies don't rely on belief to work their wonders. So those who try the Flower Essence Gorse just to please their loved ones can find relief from hopelessness even though they belief that relief does not exist. After treatment with Gorse, this personality has new found confidence to face life with feelings of hope and positive expectations. Often, those suffering from a negative Gorse state are ill in both body and spirit, and as a result, suffer from chronic illnesses. 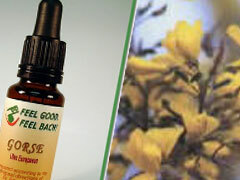 Fortunately, as with many Bach Flower Essences, treating the spirit with Gorse allows the body to heal as well. Learn more about this healing flower essence at www.bachflower.org. If you're not sure this is the remedy for you or if you may need treatment for a combination of problems, come to FeelBach! to take the questionnaire and see which of Dr. Bach's flower essences will help you most.